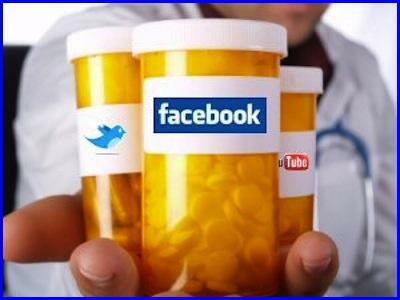 I try to limit my time spent on Facebook. Though I like using the network to keep up with faraway friends and family, I find the content and culture of the app to be generally toxic. Not the kind of noxious that knocks you out with one whiff, but the kind that seeps in through the guise of casual pastime and keeps you coming back for more until your hooked. Today I signed on and managed to (mostly) dodge temptations to get caught up this indignation or that righteousness. The key is to speed past wordy posts full of all caps, snarky memes, or links to sites whose names contain words like viral or patriot or Turks. In pursuit of cute summertime photos of nieces and nephews, I even resisted the urge to stop and coo over a Facebook memory, which depicted a slimmer, happier-looking me from 7 years ago. In my midday work lull, I just wanted to feel that little bump I get from seeing images of my favorite people, nothing more. But then a post from one of my oldest friends caught my attention: she was lamenting having read about or witnessed a series of scary events that’d taken place this week in the town where she lives. It’s the town I grew up in. The one I remember as being the sort where you could leave your doors unlocked and your children outside past dusk without worry. It’s the Smalltown, USA that I keep in my memory as being clean and kind and free of big city problems like homelessness. Now, despite my efforts to block out gnarly news in my feed, I was faced with a report that there is a substantial and growing population of homeless people in my hometown. When asked about what’s happened to cause the shift, her response, in a word: Opioids. In this prescription-soaked culture, opioids are the hottest trend. So hot, in fact, that some reports credit the class of drugs with the deaths of 33,000 Americans in 2015. And while, these deaths include overdoses from illegal drugs, like heroin, the wildfire spread of opioid abuse can be attributed to legal prescription drugs. Rx meds are so ubiquitous, so ingrained in popular culture, that the image of those puke orange pill bottles has found it’s way onto the fashion racks. 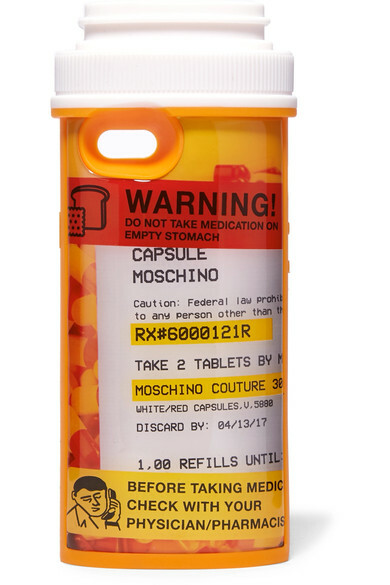 What you see above is not something from a medicine cabinet, but a phone case from the Spring Summer 2017 collection by Moschino. 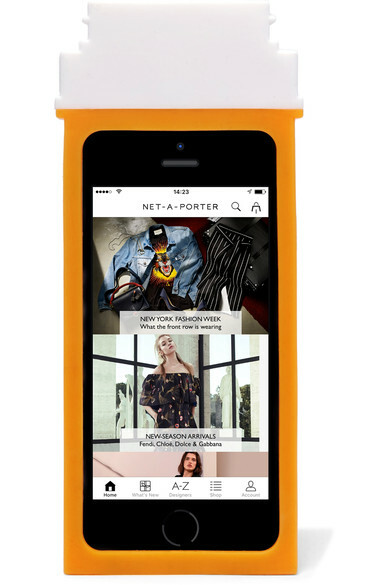 I was engaged in a different addictive pastime – browsing the Net-a-porter.com sale – when I spotted it in all of it’s disgrace. And the timing couldn’t be worse. I’d just learned that my innocent hometown was being stained by fallout of pill-popping addictions when I saw this garish display of everything I hate about fashion: tasteless, wasteful, and self-destructive consumerism. The design, from a creative director whose a known thief and proponent of throwaway culture, even features a cheeky expiration date, reminding any consumer with a conscious of the planned obsolesence found in too many seasonal collections. The trouble is the culture (via social media, medication, and shopping) has so many of us walking around unconscious – numb, dumb, and stumbling about looking for the next fix – that we’re not readily aware of how damaging it can be to participate in these dopamine-inducing habits.